Philly Bird Nerd : Hey Loon, You Are On the Wrong Ocean! 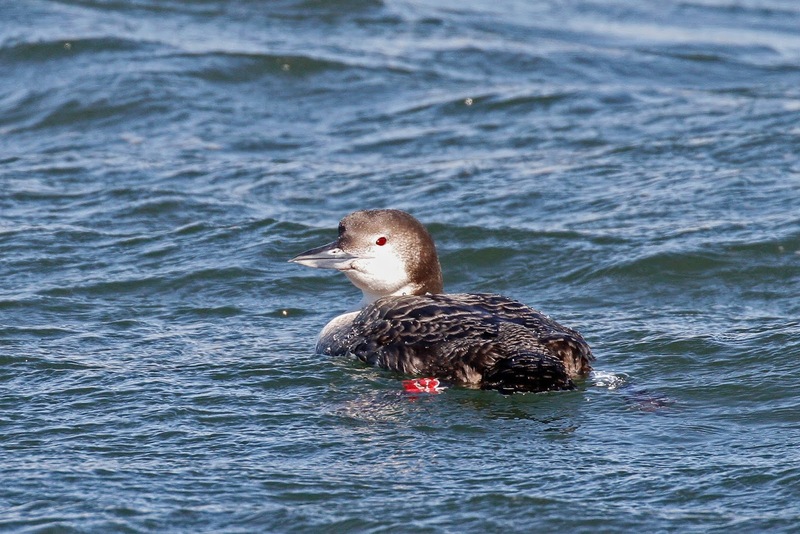 As far as Loons go, we have 2 species that hang around our area in winter - Common Loon and Red-throated Loon. 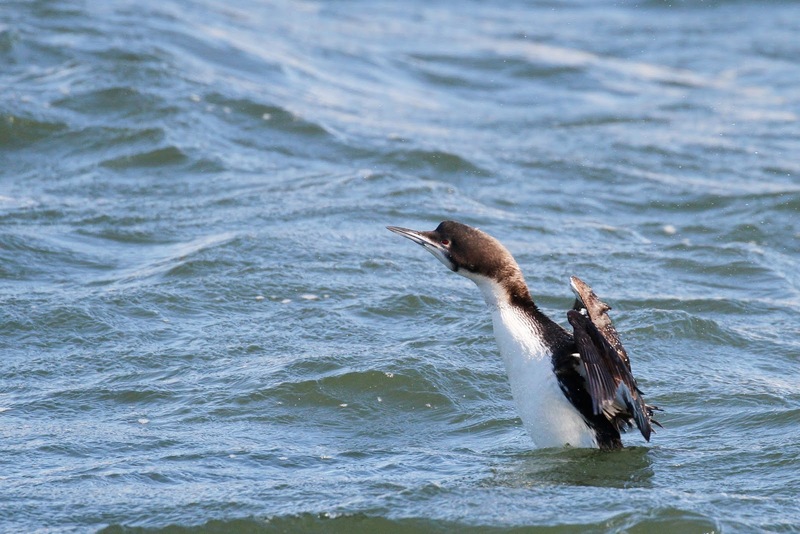 Occasionally, a loon from the west ends up on the wrong ocean for the winter. 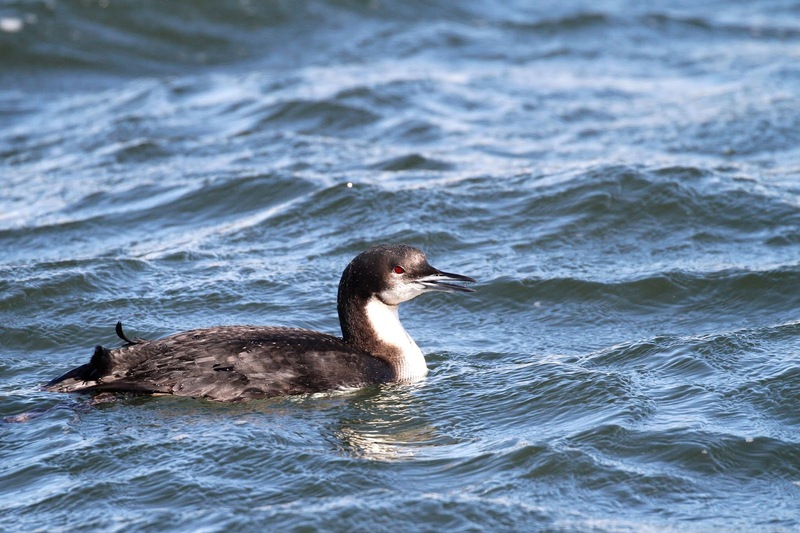 This year, a Pacific Loon has been spending time at Manasquan Inlet in NJ. I am old enough to remember my parents having a weather radio. Back in the day, we didn't have the Internet or mobile apps giving us up-to-the-moment weather alerts. Back in the 60's and 70's, we had a special radio that only provided weather information. Why is this relevant? Because the weather alerts included tide information "from Manasquan Inlet to Cape Henlopen" and I always wanted to know where Manasquan was. Now I know. Marty and I decided to head down to the inlet in hopes of seeing the Pacific Loon. We have both seen Pacific Loons before. 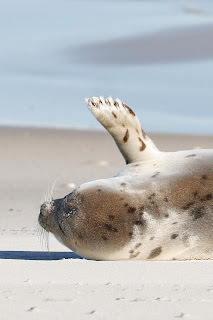 I saw one waaaaaaayyyyyy off of the beach in NJ a few years ago and we both saw them in Alaska flying past St. Paul Island. 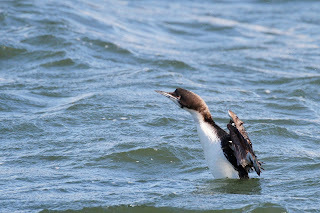 We wanted to see this one because reports were that the bird was swimming the inlet and giving everyone a close-up "show". Of course, we headed down and encountered 20 mile per hour winds with strong gusts and 20 degree temperatures. That didn't deter us from standing along the inlet waiting. And waiting, and waiting for the Pacific Loon to make an appearance. 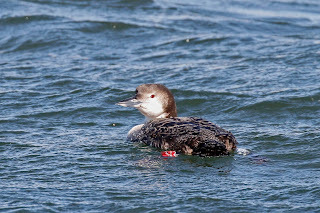 We passed the time by photographing Common Loons and found one that had leg bands. You can see the red band in this photo and maybe even make out the light blue band on the other leg if you look closely. At long last, the Pacific Loon popped up across the inlet. We had brief views before it dove under again searching for a meal. This frustration continued for 20 minutes or so until finally, our perseverance paid off and the bird popped up right in front of us! 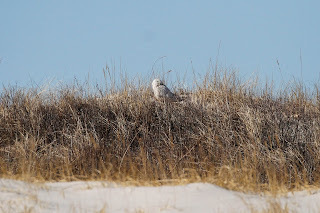 The field marks to look for on this bird are darker back, thinner bill, smaller overall, and the "chin strap" which is that dark line under the chin. You can see the chin strap in both photos. 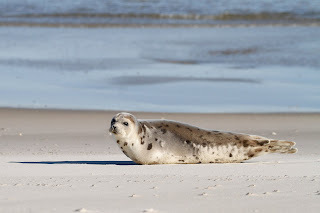 Once we had our fill of the Pacific Loon, we headed down the coast through the seaside towns of Tom's River and Seaside Heights to Island Beach State Park. This park is on the other side of Barnegat inlet. I've never been to this side before and wanted to explore. 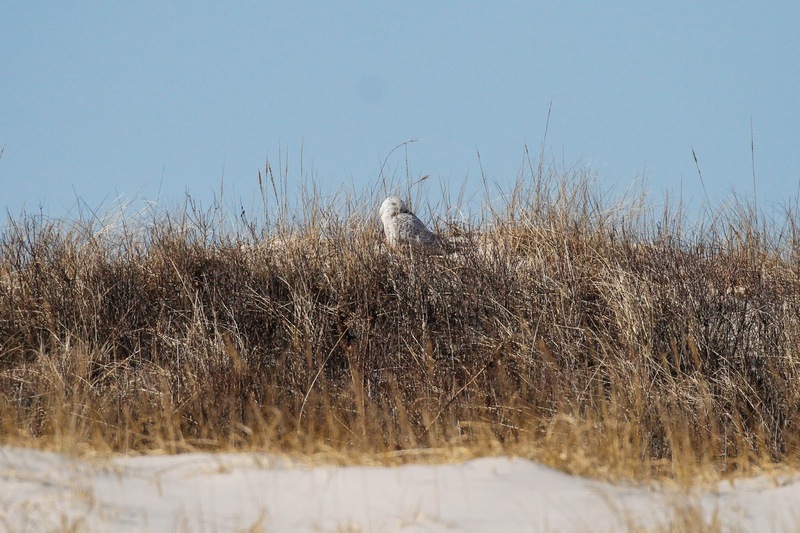 There was a report of a Snow Owl on the dunes. We stopped to have a quick look. I noticed a falcon out of the corner of my eye. 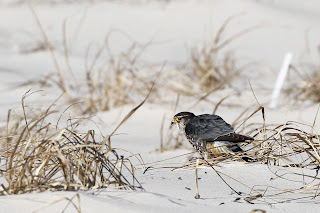 He was on the beach tearing the feathers off of his lunch. We couldn't tell what species of bird was on the menu but we were able to get pretty close. We initially thought it was a Peregrine but after review, the falcon is a Merlin. We walked the entire beach to the inlet which was over a mile. The wind was at our back on the journey. Now for the unpleasant walk back to the parking lot with the wind in our faces. Yuck. The state park allows vehicles on the beach. A guy stopped to ask if we needed a ride. We must have looked really bad. LOL. 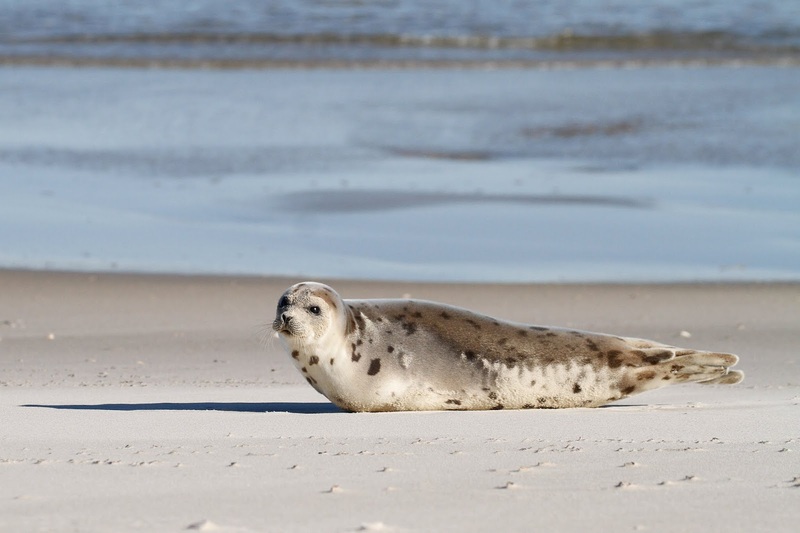 He alerted us to a seal on the beach. What a treat. 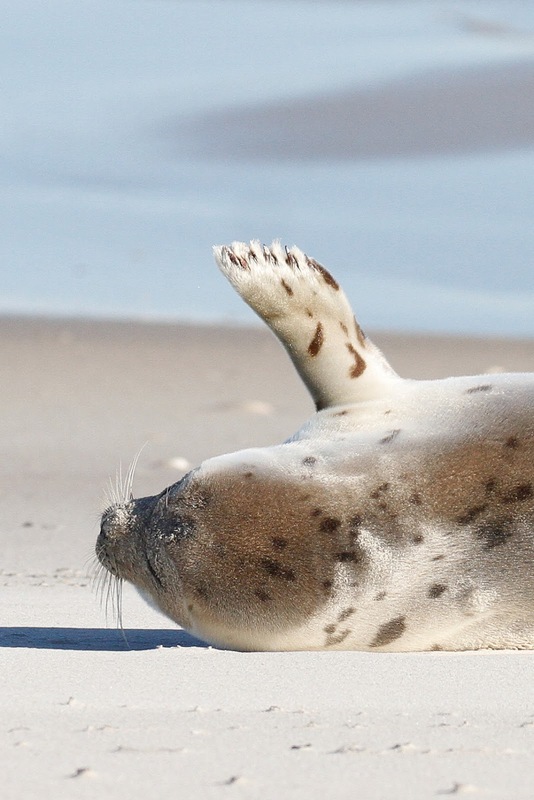 This Harbor Seal could care less about the people or the trucks. She just lounged there occasionally looking around. Then we said goodbye. She waived.